"Passive-agressive people are also known as 'the underminers.' 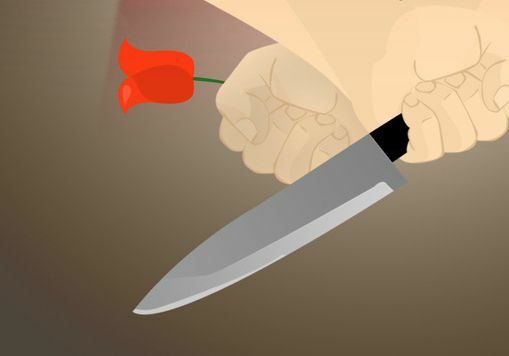 They will smile to your face, but then stab you in the back. They will tell you they stood up for you, but they really helped sink you. They will give you a compliment, then follow it up with a negative notation. ("Nice skirt! On sale?") You try to help them get better, change, or understand what they've done, but do not bother. Passive-aggresives 'would rather be right than successful.'" I took down these notes and more at a medical seminar recently. I found it interesting that even the medical profession recognizes that this pattern of behavior is so prevalent in society that the general public needs to be trained, not just psychiatrists or sociologists. What about you? Who is passive-aggressive in your life? I find that women are much more passive-aggressive then men. We can be our worst enemies, whether on the dance floor or in the work place. Think of a woman you know in dancing who has been nice to your face, but cuts you off on the dance floor? Critiques your clothing choices, partner choices - any choices at all - right after complimenting you? But men do it it too - they ask you to dance, which is always a compliment, but then they start correcting you on the floor. Passive-aggressives love to compliment first because it makes you drop your guard - it ingratiates you towards them - and makes you less suspicious when they snark at you. Compliments hide their aggressive nature. You'd call them a jerk… if they weren't so nice to you that one time… Get it? Niceties are a tool passive-aggressive people use to make you think it's you and not them when their negativity gets you down. The bright side? Passive-aggressives only snark on those they feel threatened by. I'll never forget the time a woman offered me a ride to the best hotspot in town when I was still in college without a car. I thought she was so nice. But then, once she had me in the car, she spent nearly the entire hour outlining her deep hate and disgust for one, certain particular kind of person. She kept repeating, "I believe - no, I KNOW - that this one kind of person is the one God hates - even more than Satan - and I agree - I hate them even more… They deserve every kind of rejection they receive. I think they are the greatest abomination to this earth..."
I nodded, listening intently, turned off on the one hand, but super curious on the other. Why didn't she just say it? Who was this person? What in the world had they done that was worse than evil itself? I had never heard such conviction and precise disgust in my life… so I just had to know: Who is it? And then, and I'll never forget this, as she parked the car at the front of the dance, she said it: "You know. The people who were raised Catholic, say they found Christ outside of the Catholic Church, then leave it, and practice their faith at a non-denominational church." … Which was… my story. To the letter. As in, the story I just told her... last week! My mouth hung open. And she just got out of the car, happy, content, and relieved she'd unburdened herself, she went about the night like nothing ever happened. I never accepted a ride with her again. I never did anything with her again. She complained to everyone who would listen that I was being mean, but not being mean, in her book - in any passive-aggressives' book - was to smile at her and take it. Take all of it. All of her bitterness, disgust and shaming. Being nice meant pretending it never happened, and letting her run me over the next time, then the next, then the next. So I let her complain. I finished out my obligations with her, and then I got another carpool. I roomed with other people. These were my "mean" actions. So I let her bash me to others... la la la - I didn't care. I never told anyone what she did to me though. I didn't need to. What mattered to me was that I saw her clearly. I understood her true feelings about me completely. Message received, loud and clear. That's not friendship. No how, no way. Healing would not occur, no matter what I did. Remember the quote: "Passive-aggressives would rather be right than successful." To this day, she still feels that way about my life and faith choices. And that's just fine with me. But she still wants me to be okay with her assault too. A full hour of abuse - calculated and cold - and I was supposed to be "cool" with it. Nope. Passive-aggressives want you to bury the insults as if they don't exist, but that, my friends, is allowing them to win. This is my main point today. Caving in to passive-aggressives is so dangerous and awful. Putting up with their behavior is the same as saying to them, "Hey, I think you're right. I do have a weight problem. I don't dance as well as you do with that guy. And yes, you do know how to lead and I don't know how to follow..."
That's what you're saying - that's what you're agreeing to when you insist on interacting with these negative nellies who don't have the balls to face themselves in the mirror. I'm sorry, but no matter what your intentions are, you're not really "being nice" when you give way to this behavior. You're not doing them a favor. They are bullies. And when you let them bully you, you are saying it's okay for them to do it to your family, your friends, your kids and everyone else on this earth. And it's not. It's not okay. That woman still has a sour puss on her face 20 years later every time she sees me. Her lower lip glowers and sticks out and her face says, "It's not fair." And she can keep right on doing and thinking that - even 20 years later - because she did do something wrong. She did. 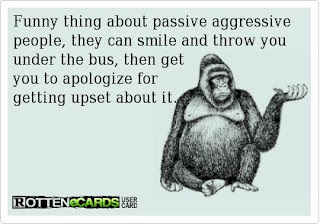 Passive-aggressive behavior is wrong. Dead wrong. It undermines communities, cultures and society - not just relationships. She was not just sneaky. She was not just underhanded. She was disturbing. She was abusive. She was toxic. But I didn't excuse it and put a sweet smile on my face and "be the better person" and keep hanging out with her, as society tells us to do these days. No. I chose to be "the healthy whole and happy person." I chose to be friends with people who loved who I was. If I had stayed friends with her, I would have always been on edge, waiting for the next ambush. And they would've come - here and there - in small remarks and in big rants. That's not okay. I opted out. I didn't let it happen again. Which means that when I walk past her, I usually have a smile on my face. Not because of her - but in spite of her. I have a happy life. I enjoy it. I love to smile. I love being me. Just as I am. And that, everybody, is what every passive-aggressive person on the planet hates.